Peter Simon has been documenting life, love, rock ’n’ roll and beyond in photos for more than 50 years. Now, the nationally acclaimed photographer is turning his attention to the island he loves best in his new book Martha’s Vineyard-To Everything there Is A Season. Simon joined Jared for more on the inspiration behind his new book. The Vineyard Gazette's review of Peter's new book highlights that as opposed to many talented current Island photographers, Peter "hits the long ball." Robert Plant revisits himself at the Simon Gallery, September 2016. One day in September one of Peter's musical idols, Robert Plant, casually walked into his gallery to pay a visit. Plant was impressed with Peter's book "I and Eye" (which was on the coffee table of his hosts in West Salisbury) and wanted simply to meet the author. Peter managed to get him to pose in front of the infamous "I am a Golden God" photography from 1975. The episode was featured in the Boston Globe in early September. Peter Simon at home with his archives. The photographer Peter Simon takes a look back at his own long, strange trip in a recent feature article in Martha's Vineyard Magazine by Bill Eville. Peter recently had radio interview over public radio station WCAI with Annie Sinsabaugh to discuss the kind of legacy he wants to leave. It's been almost two years in the works, and has been through many morphs, but at last here it is! The DVD runs over 3 and a half hours and captures most of Peter's comprehensive career. Peter has done his research and has found nothing like this in the marketplace! There are even two bonus sections which serve as a Peter Simon photography 101 crash course! ORDER NOW. Peter is now offering one day workshops. These are patterned according the student's particular level of experience and area of particular interest. Topics can range from viewing and criticizing previously taken shots, as well as those taken during field trips within the workshop time frame. He covers basic techniques and fine tuning lighting, composition, angles, bounce flash, capturing the "Decisive Moment," and components of what makes a GREAT image. Please call 508-645-9575 for more info, or email peter at peter@petersimon.com for more information and pricing. In November 2007, this astounding collection of reggae memorabilia, text and photographs was published by the premier publisher of illustrated books, Insight Editions. Over the past year this collaboration between Peter Simon and noted reggae archivist Roger Steffens has been enthusiastically received by reggae lovers around the world. Even the New York Times recently featured a 5-Star review in it's highly touted Sunday book review section. Includes a DVD! Signed by request. • See other exciting books from Peter's publisher, Insight Editions, click here! 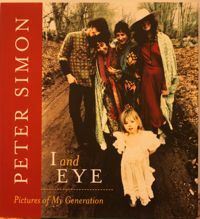 In this astonishing record of the far-ranging experiences of this generation, Peter has captured many of the major figures and events - both in the mainstream and the counterculture - of the past forty years. Grab a copy while you can! $45 Reviews below.